A NORTH LONDON RAILWAY LOCOMOTIVE. This is a model of one of five 2-4-0 tank engines built by Sharp, Stewart & Co, in 1855. Their cylinders measured 15 in by 22 in. The driving wheels were 5 ft 1 in diameter. Total heating surface was 709 sq ft. Each locomotive weighed 33½ tons and had a length of 27½ ft. THE year 1850 saw the general adoption, on British railways, of the 2-2-2 type of locomotive for express passenger work. Engines of this type, with a single pair of driving wheels, often 8 ft in diameter, were driven by cylinders which, together with the wheels, were placed inside the frames. This type of locomotive was put to universal work for an exceptionally long period. The first 2-2-2 engines had been introduced in 1833 by Stephenson, and they were built, with improvements in detail and increases in size, until 1894. For many years after that date, however, the “singles” continued in service on the lines of British railway companies. by high-pressure steam on starting. This system achieved some economy in working, but certain defects caused it to be abandoned for locomotives. Other methods of compounding were introduced in the years that followed, and these will be described later. In 1852 the compensating lever, an invention that is still used at the present time, was incorporated in the design of a 2-2-2 express engine of the Great Northern Railway. In this locomotive compensating levers were inserted between the leading and driving springs on either side of the engine, thus equalizing their pressures and ensuring smoother running. Compensating levers had, however, been patented by William Chapman in 1827 and were fitted in that year to Timothy Hackworth’s locomotive, “Royal George”. Although the majority of express passenger engines from 1850 were of the 2-2-2 type with inside cylinders and outside frames, there were some notable exceptions. Among these were the famous “Bloomers” designed by J. E. McConnell for service on the Southern Division of the London and North Western Railway in 1851-52. These engines had inside cylinders, 16 in diameter by 22 in stroke, with frames and bearings between the wheels. The driving wheels were of 7 ft diameter. A large boiler was fitted, with a heating surface of 1,449 sq ft, working at a pressure of 150 lb per sq in. The weight of the engine was 29½ tons. Forty of these engines were built between 1851 and 1862, and they hauled most of the main line expresses between Euston, Rugby, and Birmingham until 1880. Thirty-six similar but smaller engines were built between 1853 and 1861 for semi-fast traffic. These locomotives had 16 in by 21 in cylinders and 6 ft 6 in driving wheels. Another exception to the 2-2-2 type of express passenger engine common about 1850 was the “Crewe” class of engine designed by Francis Trevithick and Alexander Allan for the Northern Division of the London & North Western. These locomotives were built at Crewe and had outside cylinders and frames. LONDON-BUILT. This 4-4-0 locomotive was designed by William Adams for the North London Railway in 1863. The cylinders measured 17 in by 24 in. The driving wheels had a diameter of 5 ft 9 in. The boiler pressure was 160 lb per square inch - an exceptionally high figure for the period. The weight in working order was 42 tons. A METROPOLITAN TANK on the London and North Western Railway. Numerous engines of this class were built by Beyer Peacock & Co. between 1864 and 1871. The cylinders were 17 in by 24 in and the coupled wheels had a diameter of 5 ft 9 in. The tank capacity was 1,000 gallons. A NORTH EASTERN LOCOMOTIVE of the 492 class built in 1865 by Robert Stephenson & Co of Newcastle. Another design of passenger locomotive in general use from 1852 was the coupled 2-4-0 type with inside cylinders and double frames. The rear coupled axle was placed behind the firebox, and the coupled wheels had a diameter of 6 ft, with cylinders 16 in diameter by 20 in or 22 in stroke, the steam chests being between them. In 1855 the first of the Great Western narrow gauge 2-2-2 locomotives, the famous “singles,” was built to Daniel Gooch’s designs. These engines had 15½ in by 22 in inside cylinders and 6 ft 6 in driving wheels. The Derby works of the Midland Railway also turned out some “singles” between 1856 and 1861, with 6 ft 8 in driving wheels and 16 in by 22 in cylinders. The frames were of the sandwich type, and the weight of the engines in this class was 28 tons. Joseph Beattie also built some 2-2-2 locomotives at Nine Elms for the London and South Western Railway in 1855-56. These old South Western engines were interesting, as the driving axle had inside bearings, the leading axle double bearings, and the trailing axle outside bearings. The driving wheels were 6 ft 6 in and the cylinders 15 in diameter by 21 in stroke. 6 ft 6 in singles remained the standard type of express passenger locomotive on that line until 1865. The dimensions of the old broad gauge - 7 ft ¼ in between the rails - of the Great Western Railway gave the company’s engineer, D. Gooch, the opportunity of designing some large engines for the fast trains between Swindon and South Wales, where severe gradients had to be climbed. The cylinders of these locomotives, built in 1855, were 17 in by 24 in stroke, and the driving wheels were 7 ft diameter, the largest so far fitted to a coupled engine. The inside frames were of the sandwich type, and the four leading wheels were set in the frames and not on a bogie. The total heating surface of the boiler was 1,574 sq ft, and the engine weighed 36 tons 14 cwt. Some noteworthy narrow gauge engines of the 2-4-0 type were also built in 1855 for the heavier main line traffic on the Great Northern Railway. These were double-framed locomotives, with cylinders 16½ in by 22 in, and 6 ft 6 in driving wheels, weighing 33 tons in working order. In 1859 Joseph Beattie built some 2-4-0 express engines for the London and South Western Railway with 7 ft coupled driving wheels and 17 in by 22 in cylinders. The boilers of these engines were provided with Beattie’s patent double firebox and combustion chamber. The steam pressure used was 130 lb and Allan’s straight-link motion was fitted. This valve gear was introduced in 1855, and the following year was applied to some 0-4-2 goods engines on the Scottish Central Railway. The gear was in extensive use up to 1897, chiefly on the London and North Western Railway. Reference has been made, on another page, to the provisions of the Liverpool and Manchester Railway Act of 1826. One clause of that Act required that the engines used on the line should consume their own smoke. Earlier engines, on the Stockton and Darlington line, burnt coal, as this was cheap and readily obtainable from the collieries served by the railway. To comply with the provisions of the Act it was decided to burn coke instead of coal, and for many years after 1829 coke was universally used on main line railways. The engines of the period were consequently provided with small grates and fireboxes and short boiler tubes suitable only for the combustion of coke. Early experiments in burning coal smokelessly were made between 1837 and 1858. These attempts comprised the provision of means for increasing the air supply above the fuel, or the addition of a combustion chamber between the firebox and the boiler tubes. A third method provided for an increased length of path for the gases inside the firebox, by means of bridges deflecting the products of combustion downwards on to the fire before they entered the tubes. In 1841 an extra air admission system was introduced by S. Hall, and shortly afterwards an entirely new idea, the brick arch (now in universal use), was added, to deflect the furnace flames to the centre of the firebox and so obtain better combustion. A boiler designed by J. E. McConnell in 1852-53 had a large grate and a combustion chamber extending forward into the barrel. Another coal-burning firebox was introduced by Joseph Beattie in 1853-55, which, in a simplified form, continued in use on the London and South Western Railway until 1877. J. I. Cudworth, of the South Eastern Railway, provided coal-burning fireboxes for his standard engines in 1859. More than a hundred of these engines were built, and this type of firebox was in use on the South Eastern Railway until 1891. Between 1856 and 1860 experiments were carried out on the Midland Railway by C. Markham and Matthew Kirtley, which led to the adoption of a larger and simpler firebox fitted with a brick arch and a deflector plate in the firedoor. During the ten years following 1860 many improvements were carried out in British locomotive practice. Existing engines were enlarged, and, although few new locomotives were built with single pairs of driving wheels, these continued to be used for many years on the majority of express trains. Among these engines were the Caledonian 8-ft singles and the “Lady of the Lake” class of the London and North Western Railway. The Great Eastern, Great Western, and Great Northern Railways were also exponents of the “single” type of locomotive for express passenger work. A series of 2-4-0 express passenger locomotives with 6 ft 6 in coupled driving wheels was built between 1862 and 1864 for the London, Chatham and Dover Railway. This line, having been opened later than many other lines in Britain, had always used coupled engines. These locomotives had inside cylinders 16½ in by 22 in and outside frame plates. Between 1866 and 1873 ninety-six 2-4-0 express engines were built by J. Ramsbottom for the London and North Western Railway. Cabs were fitted to these locomotives and frames and bearings were between the wheels. Cylinders also were inside, 17 in diameter by 24 in stroke. The driving wheels were 6 ft 7½ in diameter, and the engine weighed 28 tons 14 cwt. The London and South Western and Caledonian Railways also had some 2-4-0 locomotives at this time, with outside cylinders. “PHLEGON”, a 2-4-0 locomotive designed by Beattie for the London and South Western Railway. This engine was constructed at Nine Elms, London, in 1868. It had 7 ft diameter driving wheels, and its cylinders measured 17 in by 24 in. Coupled engines of the 0-4-2 type were employed for mixed traffic on the Great Northern Railway between 1867 and 1895, during which time 154 were built and put into service. The earliest of these locomotives had 17 in by 24 in cylinders and 5 ft 7½ in driving wheels, the weight being 32 tons. An interesting development in locomotive practice was the introduction of the bogie, which not only provided additional carrying wheels, but which also made the engine far more flexible on curves. Most of the first bogie locomotives were designed by Stephenson & Co, and six were built for the Stockton and Darlington Railway in 1860. The first two of the series had 16 in by 24 in outside cylinders and 6 ft coupled driving wheels. Large American-type cabs were fitted and the weight was about 46 tons. The bogies had spherical pivots, but no provision was made for lateral movement. The last four engines of this class had the same size cylinders as the first two, but the coupled driving wheels were 7 ft in diameter. In 1861-62 some remarkable 4-4-0 engines were designed by T. R. Crampton for the London, Chatham and Dover Railway. Twenty-four of these engines were built and they were the only examples in Britain of Crampton tender engines with rear driving wheels and with the cylinders placed near the middle of the locomotive. A great improvement in bogie design was introduced by Stephenson & Co in 1861. Lateral sliding movement was given to the bogie, controlled by means of side springs. Passenger tank engines were built in large numbers in the period 1860-70. Eighty-five well-tank engines, designed by J. Beattie, were built between 1863 and 1875. These locomotives, which had outside cylinders and the 2-4-0 wheel arrangement, were in service on local traffic in the London area until 1890. An interesting type of tank engine was introduced by D. Gooch for use on the old Metropolitan Railway between Bishop’s Road (Paddington) and Victoria Street (now Farringdon and High Holborn). This line, opened on January 10, 1863, was laid as a broad gauge railway, and now forms part of London's Underground. Gooch’s tank engines had 16 in by 24 in cylinders with 6 ft coupled wheels, and twenty-two were built between 1862 and 1864. These were the first condensing tank engines, the exhaust steam being turned into the water tanks while in the numerous tunnels of the Metropolitan line. Another type of tank locomotive also made its appearance in 1863. This was a 2-4-2 engine with radial axleboxes at either end. These axleboxes, patented by W. B. Adams in 1861, were so constructed that the axle was permitted to move, in a curved path, from side to side. This arrangement enabled the engine to traverse sharp curves without difficulty. Some 4-4-0 tank engines, with outside cylinders, were built for the Metropolitan Railway in 1864. The coupled wheels were 5 ft 9 in diameter and the cylinders 17 in by 24 in. The front end of the engine was carried on a four-wheeled Bissell truck and the cylinders were inclined, to clear this. The tank had a capacity of 1,000 gallons and apparatus was fitted to condense the exhaust steam in tunnels. A 4-4-0 TANK ENGINE designed by William Adams for the North London Railway and built at Bow works, London, in 1868. The driving wheels had a diameter of 5 ft 4 in and the cylinders measured 17 in by 24 in. A number of 4-4-0 tank engines designed by W. Adams were built at Bow Works for the North London Railway between 1863 and 1869. Later engines of this class were fitted with an improved bogie with side-control springs. The locomotives had 17 in by 24 in inside cylinders and coupled wheels 5 ft 9 in in diameter. The weight was 42 tons in working order and the boiler pressure was 160 lb per sq in, a high pressure for that period. In 1868 Mr. Adams introduced the first of a type of tank engine that remained the standard for passenger work on the North London Railway until that line became merged into the LMS system. These fine locomotives had the 4-4-0 wheel arrangement, with 17 in by 24 in cylinders and driving wheels 5 ft 4 in diameter. The weight in working order was 43 tons 12 cwt. The design of goods engines received considerable attention in the early sixties, and some 0-4-2 locomotives were produced by P. Stirling for the Glasgow and South Western Railway in 1864. These engines had domeless boilers, steam being collected from a perforated pipe. Some long-boilered six-coupled tender engines were built for the Stockton and Darlington Railway and were the standard type on that line between 1866 and 1874. The boilers had flat-topped fireboxes similar to the famous Belpaire fireboxes introduced at that time on the Continent. Two very powerful goods tank engines were built for the Vale of Neath Railway in 1864. These locomotives were eight-coupled, with 4 ft 6 in wheels and 18½ in by 24 in cylinders. Boiler heating surface was 1,743 sq ft, with a pressure of 140 lb per sq in. The weight was 56 tons. Another interesting innovation of this period was the introduction, by A. Sturrock in 1863, of a steam tender fitted with an extra pair of cylinders to increase the tractive power of the locomotive. The next important development in locomotive building during this period was the use of steel in place of wrought iron for tyres. The first successful steel locomotive tyres were produced by Krupp at Essen, Germany, in 1851, and in 1859 Naylor & Vickers of Sheffield supplied steel tyres to the London and North Western Railway. The difference between iron and steel tyres in wearing qualities was remarkable. An iron tyre lasted for 50,000 to 60,000 miles, but a crucible cast-steel tyre ran for a distance of 120,000 to 150,000 miles before requiring renewal. A tyre of Bessemer steel (softer than crucible steel) gave a. mileage between 80,000 and 100,000. Steel also came into use at this time for crank axles, piston rods, valve spindles, guide bars, and crank pins. Steel boilers were first made in 1862, and steel fireboxes were used on the Scottish Central Railway between 1860 and 1863. Water pick-up apparatus for locomotive tenders was introduced by J. Ramsbottom in 1860. Two years later the well-known Roscoe displacement lubricator was adopted for supplying oil to locomotive cylinders, and remained in almost universal use for some twenty-five years, when various types of mechanical (force pump) lubricators were developed. The action of the displacement lubricator is quite simple. A small volume of steam, admitted to a container of oil, condenses, and the water so formed displaces an equal quantity of oil. This is forced into the valve chests and cylinders, and lubricates the valves and pistons. "EMPEROR", a Great Western broad gauge locomotive built in 1880. Its cylinders measured 18 in by 24 in. The single driving wheels had a diameter of 8ft, the other six wheels had a diameter of 4 ft 6 in. The working pressure was 140 lb and the engine weighed in working order 41 tons 14 cwt. For the next decade - 1870 to 1880 - the “singles” of the Great Northern, Great Western, and London, Brighton and South Coast Railways continued to give excellent service on main line expresses. The first of Patrick Stirling’s 4-2-2 engines with 8-ft driving wheels was put into service on the Great Northern Railway in 1870. The dome-less boiler had a heating surface of 1,165 sq ft, supplying steam to 18-in outside cylinders. These remarkable engines worked main line traffic for over thirty years. Locomotives of the 2-4-0 type with inside cylinders were a feature of this period; cylinders were usually 17 in by 24 in and driving wheels 6 ft 6 in or 7 ft in diameter were common. These engines weighed about 36 tons. Lighter engines of this type were Webb “Precursors” and “Precedents” on the London and North Western Railway. These were introduced in 1874 and, with 5 ft 6 in and 6 ft 7½ in driving wheels, they weighed 31 tons 8 cwt and 32 tons 14 cwt respectively. The Midland and the Glasgow and South Western Railways also had engines of this type. A series of 0-4-2 fast passenger locomotives was designed by William Stroudley for the London, Brighton and South Coast Railway in 1876. Engines of this class gave wonderful service on the Brighton line for over fifty years. The “Gladstone”, the most famous of the class, is now preserved in the York Museum. The earlier engines were designed for mixed traffic work and had 5 ft 6 in driving wheels and 17 in by 24 in cylinders. In 1878-80 the cylinders were enlarged to 17¼ in by 26 in, the driving wheels to 6 ft 6 in. outside cylinders built for the Stockton and. Darlington Railway in 1875 were remarkable for their 17 in by 30 in cylinders and 7 ft driving wheels. A London and South Western engine built in 1877. Its driving wheels had a 6 ft 7 in diameter and the cylinders were 17 in by 26 in. The 4-4-0 type of engine was adopted as standard on the North British Railway in 1876 and on the London, Chatham and Dover Railway in the following year. In 1876 the first of the 4-4-0 Midland engines was introduced by S. W. Johnson. These locomotives had 6 ft 6 in coupled wheels and 17½ in by 26 in inside cylinders. Passenger tank engines came into general use at this time, with differing wheel arrangements. 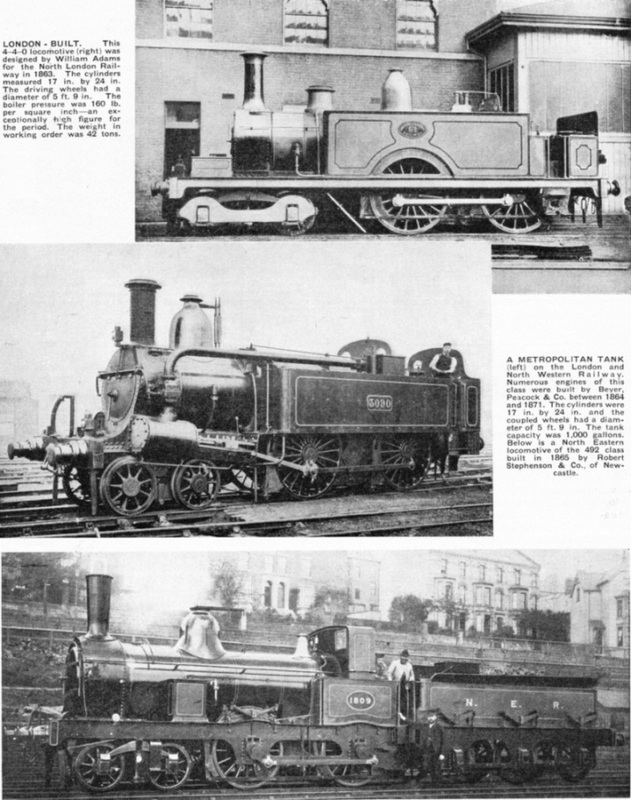 Among the most famous of the six-coupled type were William Stroudley’s small “Terriers”. Fifty of these were built between 1872 and 1880 for service on the London, Brighton and South Coast Railway. Some ran for over sixty years - a tribute to their design and workmanship. These engines gave a remarkable performance for their size; the cylinders were 13 in diameter by 28 in stroke; driving wheels were 4 ft diameter, and the weight was 24 tons 12 cwt. AN EARLY GREAT NORTHERN TANK designed by Patrick Stirling. This locomotive was built in 1879 at Doncaster for working over the lines of the Metropolitan Railway. The driving wheels were of 5 ft 7 in diameter and the cylinders measured 17½ in by 24 in. The Lancashire and Yorkshire Railway introduced 2-4-2 side tank engines for fast main line trains in 1877. These locomotives had cylinders 17½ in by 26 in, 5 ft 8 in driving wheels, and weighed 49 tons 12 cwt. Tank engines of the 4-4-2 type were employed by the London, Tilbury and Southend Railway. The first of these locomotives was built in 1880, and apart from their size - they weighed over 56 tons - an interesting feature of their design was the provision of a radial trailing axle that permitted the use of a rear water tank, in addition to the side tanks, and a larger coal bunker. The tanks held a total of 1,300 gallons of water and the bunker two tons of coal. The outside cylinders were 17 in diameter by 26 in stroke and the coupled wheels 6 ft 1 in diameter. ON THE LANCASHIRE AND YORKSHIRE RAILWAY. This locomotive was built in 1867 at Miles Platting, near Manchester. The six-coupled wheels measured 4 ft 10 in and the cylinders were 16 in by 24 in. In 1880 the first of many 2-4-2 passenger tank engines were designed by F. W. Webb for the London and North Western Railway. They had 17 in by 20 in cylinders and 4 ft 7½ in driving wheels. They weighed 45 tons 18 cwt. The standard goods engines of all lines at this time had the 0-6-0 wheel arrangement, and more powerful locomotives of this type were first introduced in 1871-73 by William Stroudley for the London, Brighton and South Coast Railway. They had 17¼ in by 26 in cylinders, 5 ft wheels, and a boiler heating surface of 1,424 sq ft.
A SIX-COUPLED LOCOMOTIVE once used on the London, Brighton and South Coast Railway. Designed by Craven, the engine was built in 1865. The cylinders measured 16 in by 24 in and the driving wheels had a diameter of 5 ft. In 1873 F. W. Webb introduced on the London and North Western Railway his well-known coal engines, with cylinders 17 in by 24 in and 4 ft 3½ in wheels having cast-iron centres. These engines weighed 29 tons 11 cwt, and 500 were built between 1873 and 1892. A powerful class of 0-6-0 express goods engines was introduced on the Midland Railway in 1878. They had cylinders 17½ in by 26 in and 5 ft 2½ in driving wheels, and weighed 38 tons. Webb's standard goods engines of 1880 were the first main line engines in Britain to be fitted with Joy’s valve gear, and no fewer than 310 of this class, with 5 ft 1½ in wheels, were built between that year and 1902. BUILT IN 1869. A London and South Western Railway locomotive designed by Beattie. The cylinders measured 16½ in by 22 in and the driving wheels had a diameter of 5 ft.